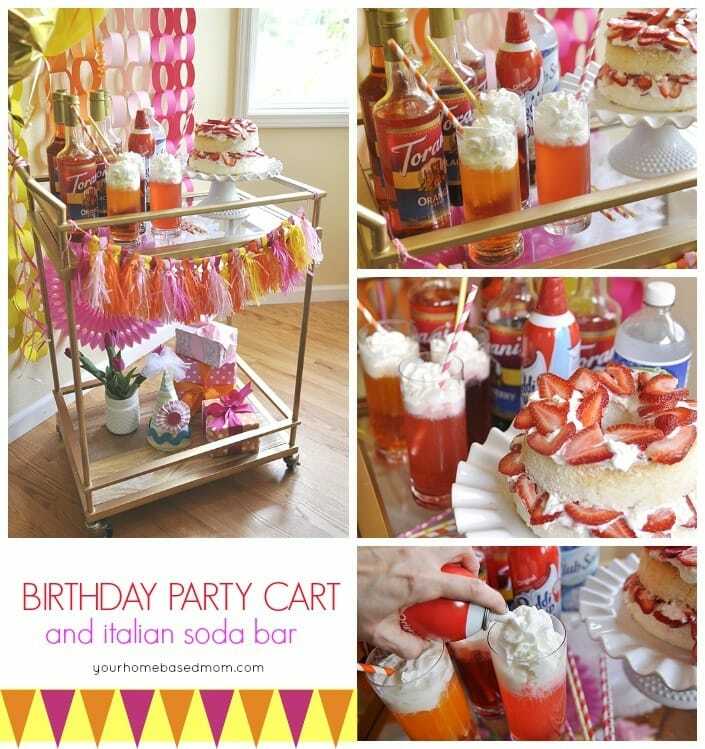 A birthday party cart is the perfect thing to hold your cake, presents and an italian soda bar. I love birthday parties! When my kids were little I must admit I may have sometimes gone a little over the top with my party planning. There was the year we had a Easter Bunny theme because one of my boys was born a few days before Easter. Everything and I mean everything at the party was shaped like an Easter bunny. It was a little out of control, if I do say so myself. Especially considering the party was for a bunch of children under three! They could have cared less that their pear looked like an Easter bunny. All they wanted to do was eat it! Believe it or not, in my old age, I have learned how to simplify a bit but still make things look like you spent hours and hours. 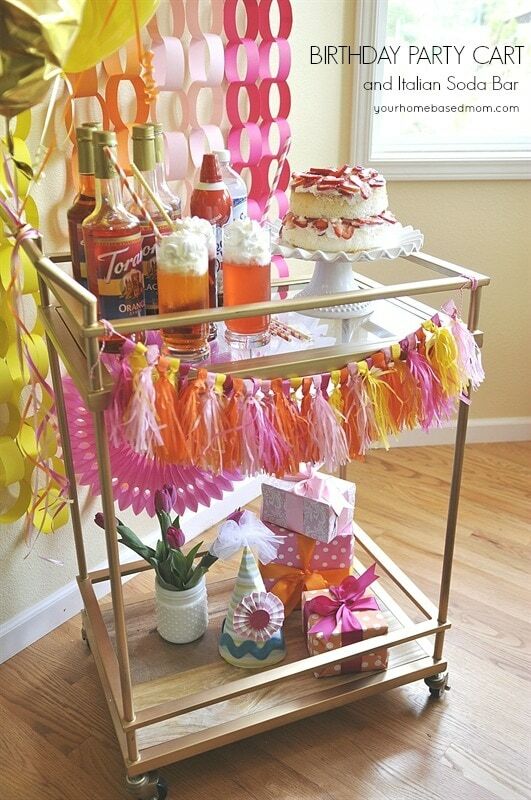 Today’s Birthday Party Cart is a fun way to simplify while still making it look special. 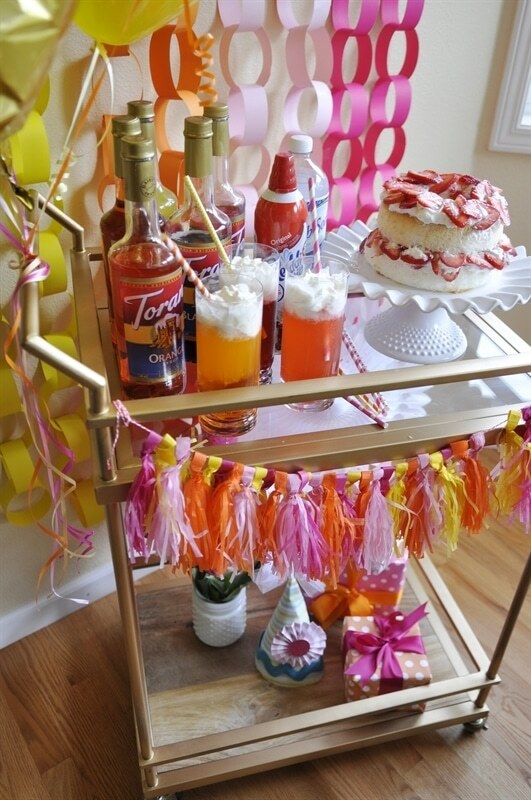 This bar cart sits in my dining room and it comes in handy at party time. It also makes your party portable. You can move it inside or outside. The first thing every party needs is a cake. You can’t have a birthday party without a birthday cake. Growing up, my birthday cake of choice was always angel food cake. My kids always wanted one too. Now you could make an angel food cake from scratch or you can head to Walmart, grab an angel food cake from their bakery, a can or two of Reddi-wip® whipped topping, and a package or two of fresh berries. Walmart is perfect because it has all the birthday supplies you might need, just one stop for your party needs. Nothing makes a party more fun than Reddi-wip®! Kids love it and adults love it. Just make sure you have plenty on hand because that stuff goes fast. To create my easy strawberry angel food birthday cake I just cut the cake in half and put a nice layer of Reddi-wip® on top of the bottom layer and then covered it with sliced strawberries. 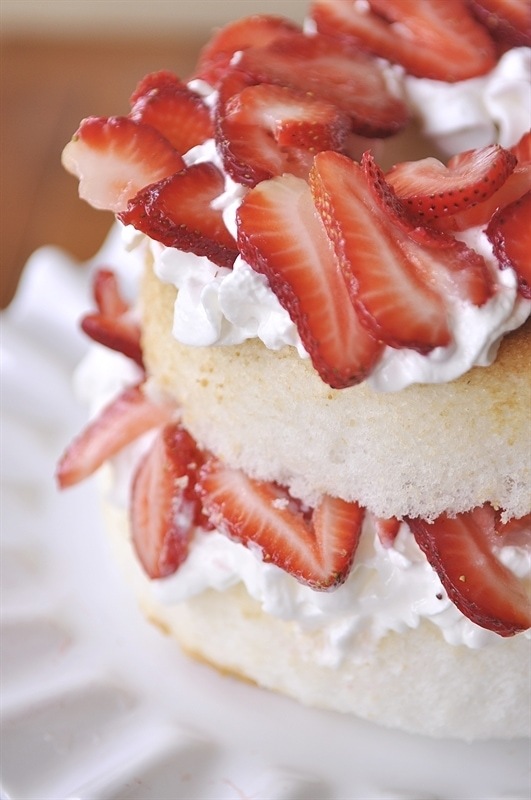 Add the top of the cake and then cover it with more Reddi-wip® and sliced strawberries. So easy and so yummy. It looks pretty too! Just put your cake on the Birthday Party Cart. I always like to have some kind of hands on food activity for my party guests to do. It keeps them busy and interacting with each other. An Italian Soda Bar is the perfect solution. 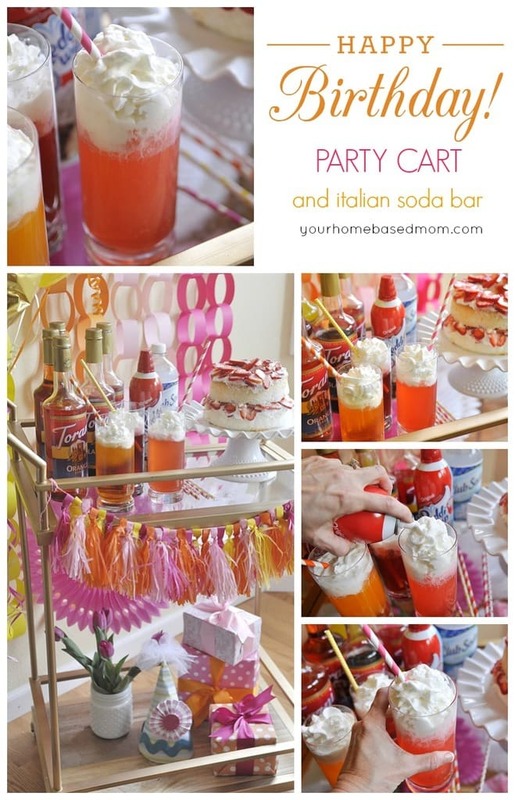 You may remember the fun Italian Soda Bar we did for my daughter’s high school graduation party. It was a huge hit! 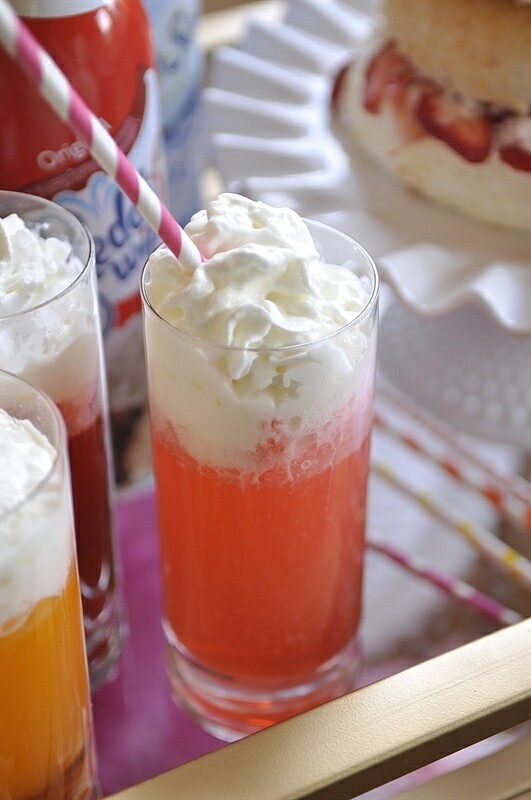 For specific directions on how to make an Italian Soda see this post. 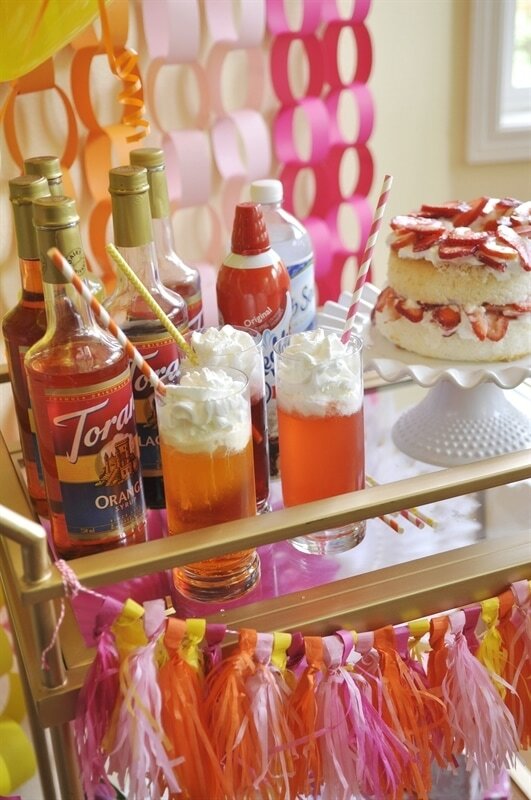 I just placed a selection of syrups on the birthday party cart along with soda water, glasses, straws and of course lots of Reddi-wip®. 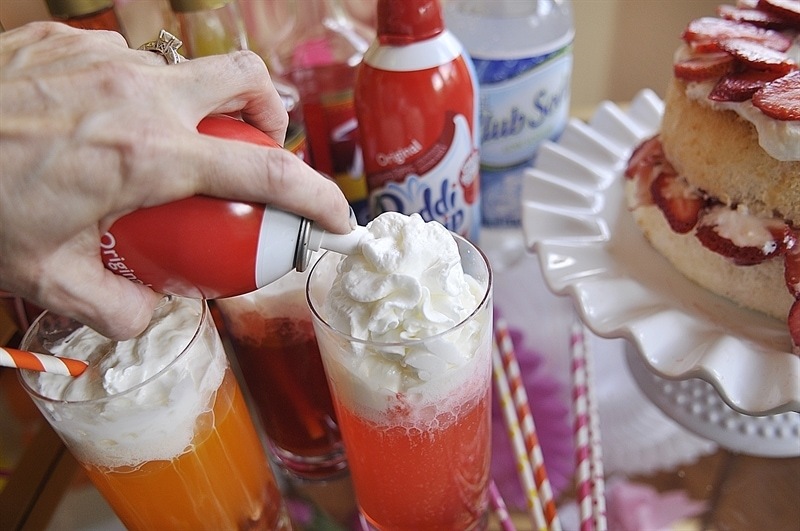 Trust me on this one – have LOTS of Reddi-wip® Not only will it be going on everyone’s Italian Soda but it will be going directly into a lot of people’s mouth too!! Who can resist squirting some right into their mouth of the can!! Real dairy cream is the number one ingredient in Reddi-wip®. Your Birthday Party Cart has everything for your party all in one place – cake, drinks, flowers and gifts. And of course no birthday party could be complete without balloons. Just add them to your birthday party cart! If you’re celebrating your little one’s first birthday, you can grab a smash cake from Walmart for free with any bakery purchase of $14.98! How about a $50 Walmart Gift Card to host this #PartyReddi Birthday Party? To enter, just leave a comment below telling me your favorite tip for simplying birthday parties. 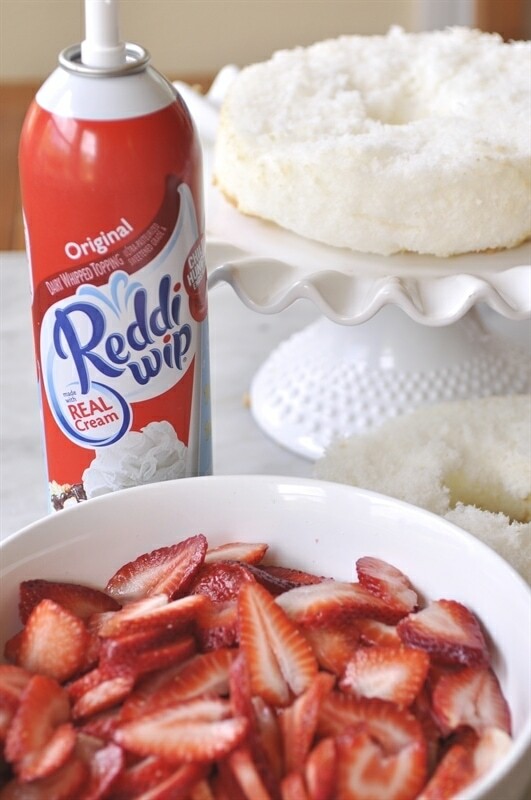 Follow Reddi-wip on Facebook, Twitter, Pinterest and Instagram for more great recipe and party ideas! 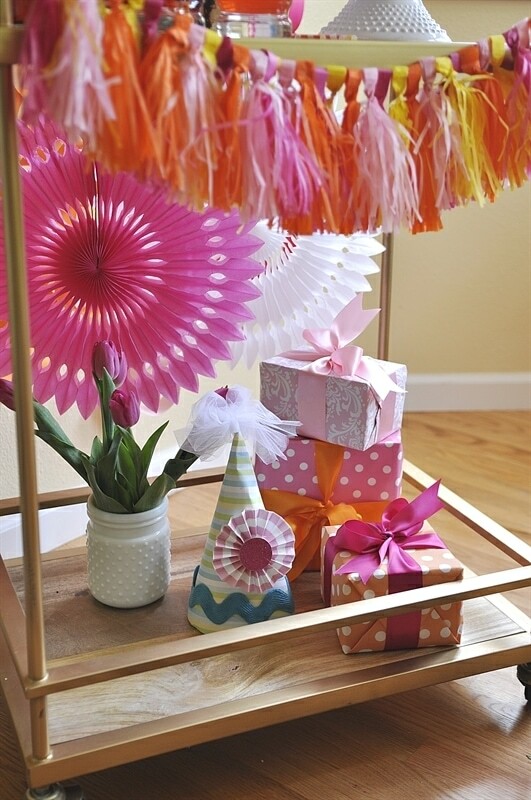 For another fun birthday party idea check out this Mini Birthday Party! I like planning everything in advance and always make dishes and things you have tried before to lower stress. I could simplify it by having you plan it, your parties look AMAZING!! Keep the food simple! Anything that might be more complicated to make – like a cake – should be done a day ahead of time. Wrap gifts as you purchase them instead of waiting until right before the party. I always try to use throw away plates and cups to help with clean up afterwards. Don’t try something new for the party. Make sure you’ve tried out a recipe or activity before the party so you don’t have a disaster. BBQ with “finger foods”, salads, and cake & ice cream served outside while relaxing on the deck! Plan ahead and make everything that you can ahead of time. Do NOT wait until the last minute! My mom convinced me to stop killing myself with cleaning before a party, since the house always needs to be put back AFTER the party. We quit doing goody bags. We are already providing great stuff for our kids parties….the guests don’t need to go home with little bits of junk toys that end up at the bottom of their toy boxes! Pick a theme! The party seems to fall into place once you pick colors, location, etc. Having party some where besides my house is always a great idea. Like for the kids a pizza place. When someone offers to help I let them. Many hands make light work! And it’s a lot more fun, too! Plan the menu ahead and set up tableclothes, etc ahead of time as much as possible. When planning a party, I will often use Pinterest for ideas and make a board delegated to the particular party (graduation, birthday, etc.) Pinterest is a great source for themes, decorations, games and recipes. I find it a very creative outlet and get inspired to come up with my own original ideas as I begin the planning process. However, I feel strongly that you don’t need to reinvent the wheel when someone else has already produced it successfully! Always keep things simple- paper plates, cups, napkins, utensils; Easy to eat foods with minimal mess. And if you have a nice park that doesn’t charge for parties, have it there! Thanks for the chance to win! I simplify the party decorations and cake, get kids to help with homemade cake is always adding extra fun. I put my 6 kiddos to work to simplify life for me :). Would love this…my oldest is turning 16 real soon! 1. Always plan ahead and make a menu that includes a simple, do ahead menu. If you can’t cook or don’t have time, don’t stress. It’s not about you being the best cook, it’s about you knowing where to buy the best food or deserts. 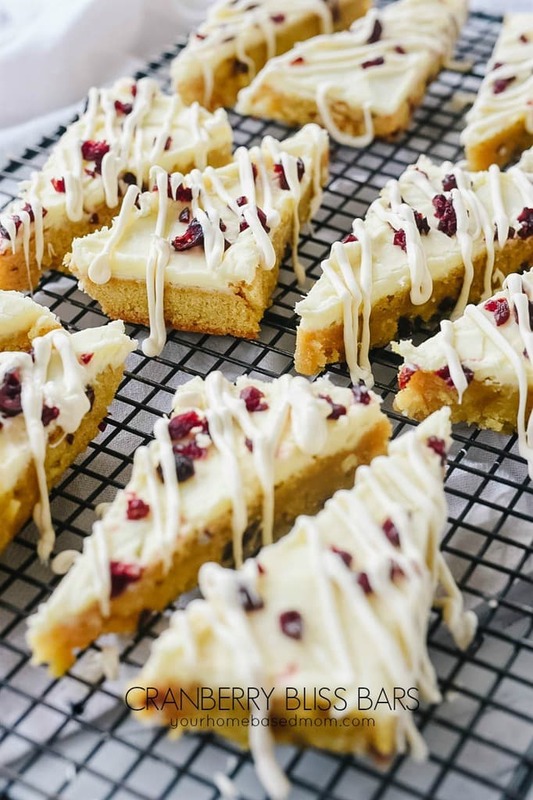 Shhhhhh…..don’t tell anyone, just place in your prettiest serving pieces. 2. Set the table ahead of time and label platters (if your using them) with sticky notes. 3. Always have music playing and candles lit. This creates the mood and feeling of a party, no matter what the size, occasion or number of guests. 4. Set up a bar that is easily accessible so people can help themselves. I always like to have at least one cocktail (or cocktail) in a large quantity, in a pretty pitcher. 5. If anyone offers to help, accept their help. I use to not be very good about accepting help or wanting anyone in my kitchen, in my way. I’ve learned that people who offer to help really do want to so simplify your life and let them, be gracious and say THANK YOU!!!! Keep it simple and don’t try to outdo all the other parties. Make lists ahead of time of what you will make, buy or prepare. Enlist help from others. Enjoy the day with the birthday boy/girl! My tip is to host the party outside if it is nice out because it cuts down on foot traffic through the house, gives everyone more space and spills don’t matter too much! I like to have everything planned far in advance and hopefully organized when the exact date comes. Using paper plates and plastic utensils. Saves time away from the party and no worry concerning any broken dishes. Always be prepared an uninvited guest. My favorite trick for birthdays is to do a really simple menu with possibly a dessert bar or hot chocolate/coffee bar so guests can help themselves and I am out of the kitchen enjoying the fun. .
For my daughter’s 14th birthday party we had everyone put their cell phones into a basket and said that they couldn’t get them until they left. All the girls had a great time outside barbecuing and Smore’s over the fire pit and they didn’t even need their phones or ask for them once! Simplify with letting people help when they offer! We keep it simple by limiting the number of kids our kids can invite to the she that they are turning. Makes it easy and simple! The way I do it is ask everybody to bring their food of choice. If it is anything to warm up or grill I will do it. The only thing I will do is the cake which is a Carvel Ice Cream cake. Yum Yum. How easy is that. Make ahead appetizers and foods so I have time to spend enjoying the party! I keep the food simple (as in lots of tried and true appetizers) and focus much of my attention on the cake. Because, really, the cake is the main focus of all those party pictures! I use disposable plates/cups/silverware to simplify! My best friend and I always help each other out at parties. We work well together and have fun at the same time. My favorite tip for parties is to plan in advance and enlist friends and family to help with cooking and setting up the party! I wish I was better at simplifying – we’re getting ready for my daughter’s first birthday and I may have gone a bit overboard…but I am really excited about all of the little details, so I guess it’s ok. The best thing I have done is decided not to host it at our house – it’s a big relief! My tip is to use precut/prewashed veggies, snacks, fruit to make your menu tasty and easy to assemble. Make the main dish in the crockpot so you have more time to make dessert. Preportion the cake on little plates and scoop ice cream balls ahead of time. Most definitely use disposable cutlery, dishes and napkins. That way you can entertain and not have to worry about washing them to have enough to go around. Make as much as possible in advance leaving only a few things to do on the day of the party. Invite over someone who will help you quickly set up. Relax whatever isn’t done no one but you will know! I love preparing as much as I can beforehand. It makes a huge difference to my level of craziness on party day. 🙂 I also like themes. They keep me on track and make finding ideas easier. My favorite tip is to prepare as much as possible beforehand, the freezer is your friend. Hi- love this idea! 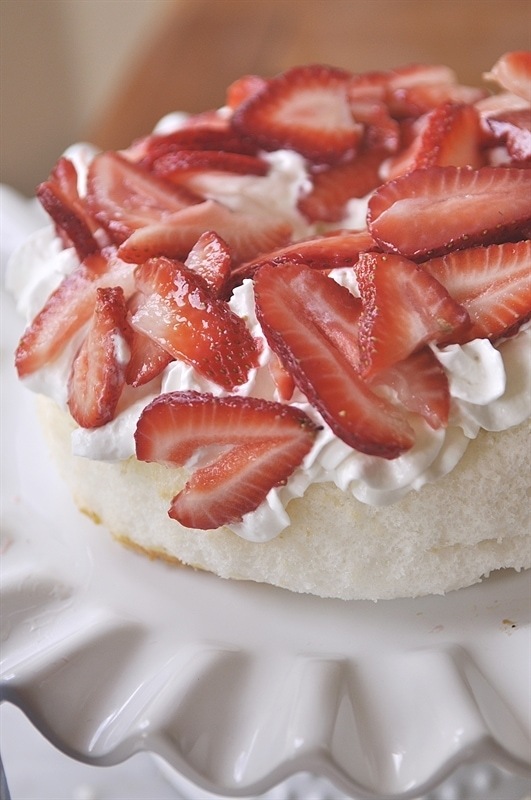 We have been doing angel food cake with strawberries and Reddi Whip for over 20 years!! It’s so yummy. My tip is to let the child make as many choices as possible, within reason. I have found in my over 40 years of parenting/grandparenting that they often make much simpler choices than we do, especially when they are expected to ‘help’! I have found that less is more. So for goody bags I buy something nice that’s a few dollars that goes with my theme rather than lots of little junk and candy. For example, we did fancy Nancy one year and I picked up actual fancy Nancy books and gave one to each girl as they went home. Having parties between mealtimes cuts down on the amount of food needed. A good way to simplify a party is to not be hung on everything has to be homemade, it is OK to include some store brought items. Get some of the gear from the Dollar Tree so save money. 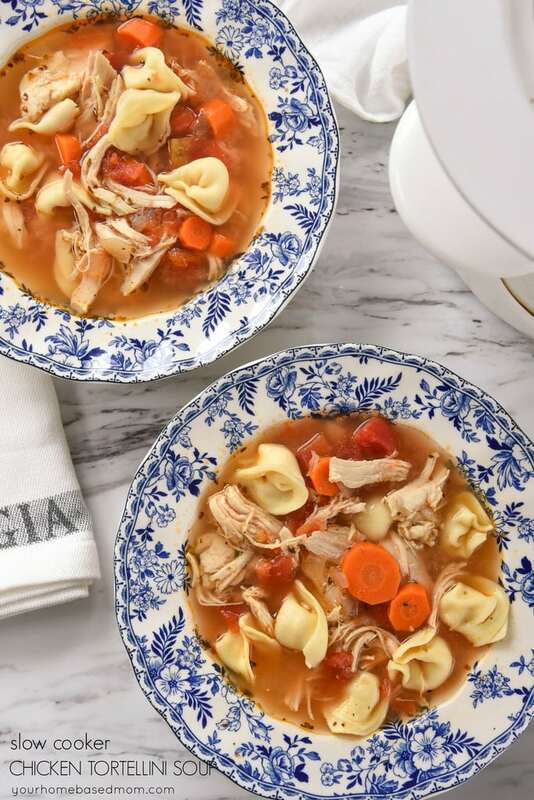 Keep recipes simple and do as much ahead of time as possible! I try to stay away from hosting parties because I get so stressed about having a perfectly clean and decorated house. Well, I discovered that most guests, especially teenagers, don’t notice or care. They just want to hang out with their friends. So now, I just make sure bathrooms are clean and stocked, have plenty of food and drinks (and it doesn’t even have to be fancy food/drinks), music, good movies, and space for the kids to spread out. They just enjoy being together. My tip is to have the party in a park or somewhere other than your house! And make it a potluck to cut down on the work. Doing as much food and set up prep the day before so im not running around like a maniac all morning! I like buying the birthday supplies way a head of time, so I don’t have to rush as I get closer to the day. I use paper plates, napkins and Chinet crystal to make our birthday parties easy and fun. I like to keep things simple by just having a small party with only family. Do as much in advance as possible! I always like to have a schedule and have a separate area for the kids to romp and play in between activities. Keep them busy! 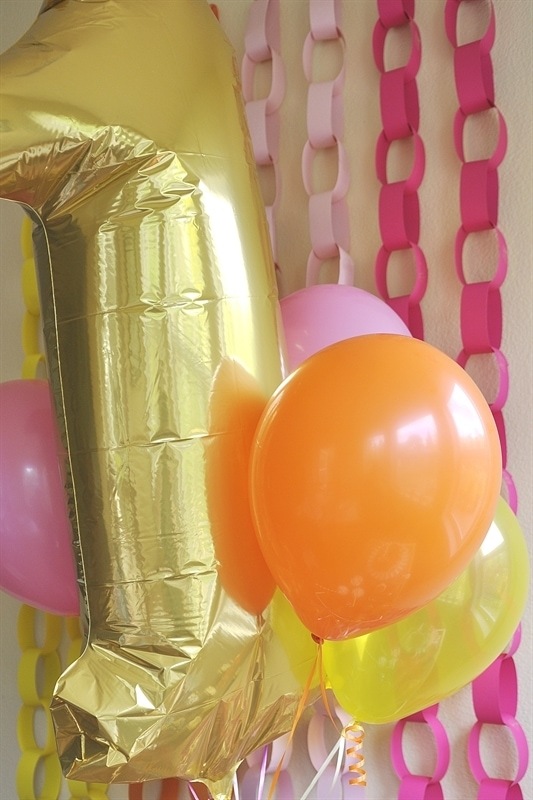 Have the party at another location, and bring you own decorations. I also make reusable decorations out of felt. Just hang them in different ways.